Stag beetles have always been very much part of our culture. There is already a superb collection in a book dedicated to that: Lucanus cervus depictus; the examples here are just extras. 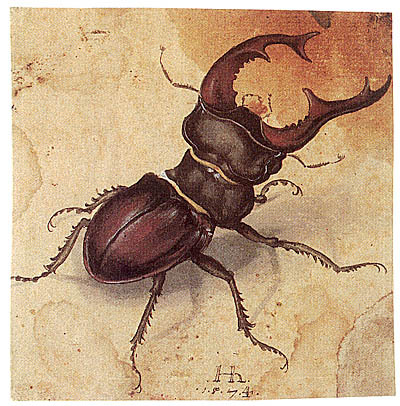 Below left is a water colour by the German artist, Albrecht Dürer, 1471-1528. Nowadays in Germany stag beetles still have the most interesting vernacular names, thus reflecting their long standing popularity. If you have any contributions, contact: Maria Fremlin.